WOW, its been over a year since I posted anything last time… I am going to try and start investing some more time into my blog, so any readers that I still have I am sorry for the long gap – its been a busy period. Anyways back to the help – lets start with a nice easy quick one. 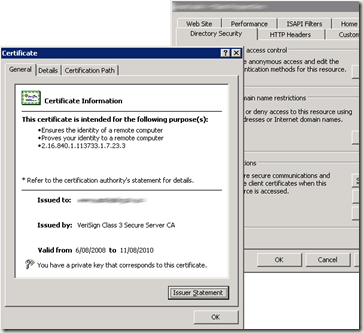 You might remember in SQL 2000 days to give some rights to trace you needed to give the user SYSADMIN rights, well gone are those days, while it still works lets face it, its not too secure is it! Now that user will be able to start tracing databases using SSMS and not having to be a SysAdmin! So you are here because you for got your mater password or didn’t enable SQL authentication and create an SA password on setup and your windows authentication is failing… Well the good news is this should help you change the password. Follow the steps below to rebuild the Master Database. "C:\Program Files\Microsoft SQL Server\100\Setup Bootstrap\Release"
The instance name will be MSSQLSERVER unless you are using a named instance and in that case change MSSQLSERVER to your instance name and the SqlSysAdminAccounts will be an account with SysAdmin (Be sure to change the domain\username details) rights then and press “Enter” again. I was always very envious of the US and UK, where Google had released there fully blown GPS navigation to the public via Android phones. And then I stumbled upon a post back over at the great guys at XDA, and it would seem someone has come up with a hack to allow the GPS navigation for Google for ALL countries! I have loaded it up and run it on my Desire, and wow is this thing extremely accurate, even more so than my dedicated tom tom unit. The only complaints I have is, well its still Google maps so its using data, if only it could download the maps to the SD card, it would just be so much sweeter. And the voices, the very much a Droid voice is hard to understand as it speaks a little fast, as it says the street name and the turn IE. ‘Continue on Bond street, and turn left into Daisy road’ I think this feature is great that it is saying the street names unlike other GPS solutions but they need a better voice, something more human than robotic. Anyways enough of my chit chat you want the download right?! Just download & install. Then you will have both original and modded maps installed at once. A perfect example of using a script like this is if you are trying to target a particular market, for example. I am based in Australia, and I have a .com.au domain, and a .com domain. I might have a different offering or market to what I offer in Australia, so with that said I have 1 website but with multiple alias’s and pages for different markets. I need to somehow separate these with the URL, as .com.au tells me AU, .com tells me global. this is the second URL you want it to redirect too. It’s been a while since my last blog post, what a busy year it has been. Excuses aside, I thought I would take the time out to share my findings and experience with ZOHO products…. While I used the ZOHO projects (which is essentially a project management software online) some time ago, I recently logged back in and and had had a look at some of there other offerings, and I have got to say wow haven’t they done some work! They have in total about 22 web based applications, all of which have there use, but some more so than others, especially the business applications, such as CRM, Projects, Meetings, Invoices, Creator. These online apps give you amazing amounts of functionality and some with even better flexibility to tailor it to your business needs. While some applications may not meet the needs for large enterprise business, they certainly could be utilized for the SMB market. Take for example the Zoho creator, it gives the business / user a simple UI, it also provides advanced users script to create databases that have almost no limit, if you had the time and patience, you could create yourself a CRM system, assets management. The best thing about the Zoho products is that they are free, well at least to a degree, for super small business you actually be able to get away with using them all for free, as they impose limits on users / and or functions per month. but they also do have really quite affordable pricing models. NOTE: I am in no way associated with Zoho, nor am I receiving any finical gain. I am simply a user evaluating and enjoying my experience with there applications. With the release of windows 7, they have no longer included a default windows mail client for the first time, in as long as I can recall. So if you got use to outlook express or windows mail in VISTA, then you might want to get your hands on Windows Live Mail, very similar to windows mail in terms of interface, but for multiple accounts, I find it actually surprisingly much easier to manager all my email accounts. Finally some one has cracked it, they have made an easy to use and style menu replacement. Your probably about to say but there are hundreds or Menu replacements for DotNetNuke (DNN) and yes there are, alot of which I have used, though none of them used DNN the existing styling. The one I am most excited about was the drop in replacement for the Solpart menu, lets face it this was always the most style able and configurable menu that ever came out with std DNN, and SEO has always been a pain in the rear end with this menu. So for people like me that have a stack of DNN sites that used the solpart menu simply for style purposes over SEO (which lets face it the avg person / client that knows nothing about what SEO is, wants looks over functionality). I like the best of both world’s DDN Done Right (Mark Allan) has produced an awesome extension for DNN with a simple install and a simple change to the skin tag and hey presto your solpart menu retains its funky look as it did before and you have some better overall SEO structured menus, True hyperlinks, and a better overall user experience. and further to that Mark has created Mega menus also, and look to be creating additional templates, I know I for one will be watching very closely to DDR’s site for further updates! 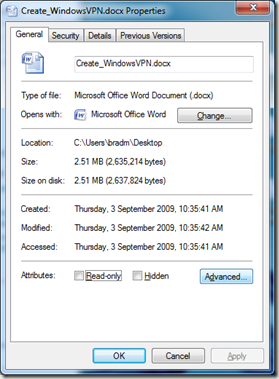 So we were getting various sharing volitions when trying to save some changes to an existing document, both on windows VISTA and windows 7, this started to become an annoyance, but let it go because it was only now and then. I found out it wasn’t isolated to me, turns out many others have been affected by this annoyance also. So you might get error messages like "Your changes could not be saved to ‘Filename.xlsx’ but were save to a temporary document ‘CERSS322′ (this is a random string). 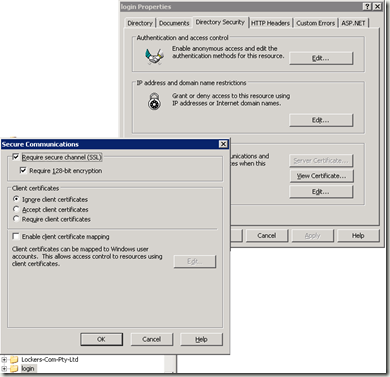 Close the existing document, then open the temporary document and save it under a new name." If you try and save it again you might also get "Your changes could not be saved to ‘Filename.xlsx’ because of a sharing violation. Try saving to a different file." once again if you were to save it it might actually save correctly. 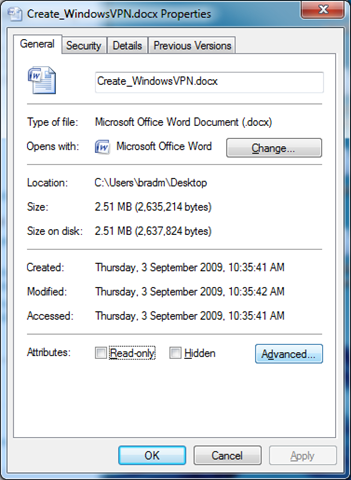 There was lots of talk about an Anti-Virus might actually open this file scanning it when you have it open hence the reason for the sharing violation, and this could be well possible, but its more likely to be the Windows Desktop Indexing service., you could disable this though that might be a drastic measure. 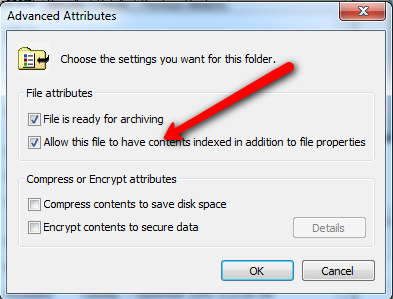 you can right click on the file and turn the indexing on that file off. See images below for more info. Some times there is a need for clients to have only particular pages protected by and SSL Cert. which means we need to create a redirect to HTTPS, this could be done on the page level through the code, but there is a better way, via IIS, let me show you how. Next you need to select which files or folders you want to have protected with your SSL, in other words which pages do you need to be HTTPS:// on, in this case I have selected the ‘login’ folder on my website, within IIS locate the folder or file right click on it and choose ‘Properties’ . 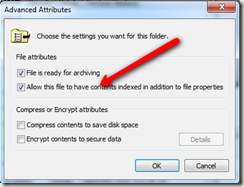 If you selected a file look for the ‘File Security’ Tab. Select the appropriate tab, toward the bottom within the ‘Secure Communications’ you will see an ‘Edit’ button click this, you will then be prompted with a pop-up box with some additional options, here you will notice that ‘Require secure channel (SSL)’ and ‘Require 128-bit encryption’ are not ticked, tick both of these options, then press OK. And Ok once more. 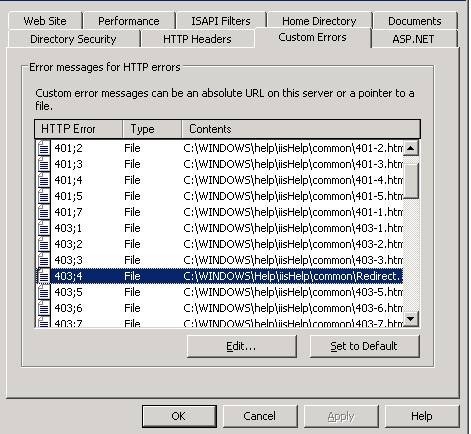 Because all requests to the folder or file you have set now MUST use HTTPS, people by default will get a generic IIS 403.4 error, to prevent this error and redirect the user to the HTTPS link you must perform a redirect. IIS can do this for you. 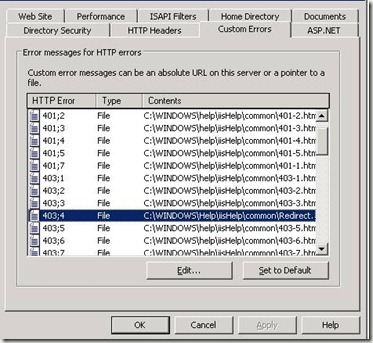 I have called mine RedirectSSL.Htm and replaced the default 403.4.htm with the custom error. This script will change your URL to add the HTTPS prefix, by using this as your landing page for the error 403.4 the user will be re-directed to the URL with HTTPS in front forcing them to use your SSL.